In the video, Del Bigtree is sitting at a table with some anti-vaccine luminaries talking about autistic children. Suddenly, he begins talking about autistics as dogs, chimps, and other animals. While he acknowledges that “it sounds wrong,” he keeps on going. And the others on the table just laugh and go along with it. Del Bigtree is the producer behind Andrew Jeremy Wakefield’s high school A/V club project, by the way. He’s the guy trying to sell us the idea that autism is a catastrophe. He seems to now want to sell the idea that autistics are like dogs and chimps in their mental capacity or in their ability to communicate. Jerk. I hope the money is worth it, Del. Which is it, Mr. Handley? For the uninitiated, JB Handley may not be a familiar name. It certainly wasn’t for me up until about seven years ago. Mr. Handley is one of many people behind “Age of Autism” and “Generation Rescue.” Both anti-vaccine groups who seek to link vaccines to an innumerable number of conditions. They also seek to link vaccines to autism. “When Lisa and JB Handley’s son was diagnosed with autism in 2004, they simply did not believe it would be [child]’s lifelong destiny. They committed themselves to healing their son. “Man, did I get played by the CDC. It was the winter of 2003. You couldn’t turn on the T.V. without reading about another child dying from the flu: it’s a particularly bad strain, children are at high risk, flu shot supply is strained, get your child vaccinated while you still can! “The first shot was in December. Our Christmas videos that year show a very normal [child] — excited about Santa’s arrival and closely tied to his older brother. The booster was in January. Gone where? Ah, yes, gone nowhere. JB Handley seems to be the kind of person who sees children with special needs as “gone” or “missing” or “dead.” None of which is true. Those children are still alive and there, and many reach milestones which allow them to look back on their parent’s statements about them, something that saddens me as a child should never be referred that way by someone who loves them. But I digress. JB Handley spends the rest of the article using misinformation and intellectual dishonesty to tell us how vaccines don’t work, how they’re dangerous, blah, blah, blah. Typical anti-vaccine stuff. 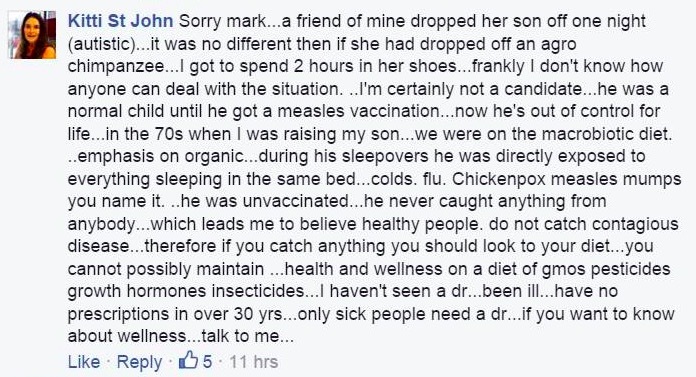 But note that his son was “sick all the time” and that this is why he and his wife opted to have the child vaccinated. “A Lafayette couple, certain that chelation therapy has helped their autistic son, stepped squarely into the controversy surrounding the causes of autism and its treatment Tuesday as they joined 150 other parents in launching an international support group that will aggressively promote the treatment. So now it’s a story that the child was sick starting at two months and got worse from there. But he was healthy and happy until 18 months according to JB Handley in 2005. This doesn’t make sense! The thing that bothers me most about this is that many of the people at Age of Autism make a big deal when anyone writes about their children, but then they use their own parenting experiences and anecdotes as definitive proof that vaccines cause autism. For Kim Stagliano, one of the editors of AoA, even her unvaccinated daughter has autism because of vaccines: Because of the vaccines that Ms. Stagliano received before her daughter was born. I truly wish JB Handley and others stuck to the evidence and left their children out of it. But, as you can see, their desire to use anecdotes only helps to show the inconsistency and lack of reliability to eye witness accounts and the necessity for objective, science-based evidence of what is really going on. Kitti is just one of thousands of anti-vaccine activists who take their misinformed views of vaccines a step too far and demonize autistics of every age. It’s not just the comparison of children with learning disabilities to animals like Kitti just did. It’s also the whitewashing of murders of autistic children. Calling a mother and a caregiver who brutally killed Alex Spourdalakis the victims rather than the murderers that they confessed to be is just one more step in the anti-vaccine playbook of people like Andrew Jeremy Wakefield, people without a shred of evidence that vaccines cause autism but yet want to paint autism as a horrible “disease” that is preventable, avoidable, or curable. Autism is not preventable, avoidable, nor curable. In fact, one of the biggest signs of quackery is someone who wants to sell you an autism cure or an autism preventative. That’s when you know you’re dealing with loonies, with fraudsters. I’d like to ask the Andrew Wakefields of the world what they’re doing to ensure that autistic children and adults get all the help they can to live a long and fruitful life. Because, whatever Wakefield did to “help” Alex Spourdalakis failed phenomenally and no one should trust him in any way with their autistic child, ever. If you want to argue that vaccines are part of some big plot, go ahead. If you want to say that they cause more harm than good, go ahead. All your points are easily refutable. What you shouldn’t do is denigrate autistics to the point that you endanger them and, by extension, endanger all of us. Because failing to protect the weakest among us is a sign that we’re on a downward spiral as a society. We’re circling the drain, so to speak.